E. Reynaud developed a slide show precursor the to movies which was all the rage in Paris in the 1890s. This show was Musée Grévin's biggest attraction during this time. 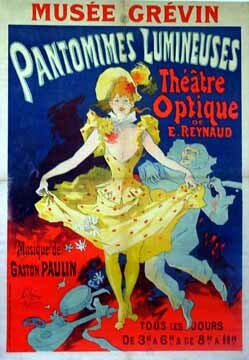 This poster by Jules Chéret displays this posterist's most famous character, the Cherette. A woman floating above the ground in a yellow dress.